This Ballerina fun jump is a great way to spread joy with your little ballerina on her special day! Your little one and her friends will love dancing, jumping and twirling in the 225 square feet of bounce space that this enchanting fun jump offers. This classic moonwalk has mesh netting along all four sides and is fully covered overhead for safety and comfort. 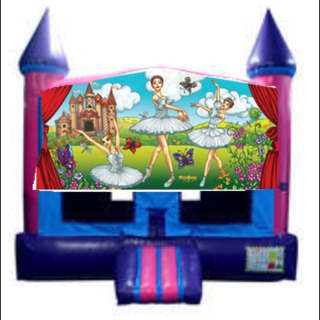 With its enchanting ballerina banner, this bounce house is wonderful entertainment for children of all ages. It is a great rental for birthday parties, church events, school fairs and more. Be ready to show off your best moves in this lovely Ballerina jumper! Got Bounce? The Bouncing Buddies Ballerina Fun Jump is great for family entertainment, providing the most popular form of amusement for children. Bouncing also puts you in a state of health and fitness, improves your sense of balance, creates an aerobic effect for your heart, strengthens your muscles, and increases the capacity for respiration, resulting in better mental performance!